The Rakhine State government has started building new homes in six villages in Kyauktaw and Mrauk-U townships for civilians who fled fighting between the Arakan Army (AA) and the military last month. District and township authorities, as well as police, had ordered IDPs (internally displaced people) to leave the temporary camps that had been established in Buddhist monasteries by January 20. The regional government is using its budget to build the new homes. A state government official told The Myanmar Times yesterday that they were still building the wooden houses for the IDPs and that they would total nearly 100 homes for over 300 people. “We are worried that the IDPs will be discriminated against by other people. So we decided to build the houses for them. All IDPs have already accepted our plan and some people have started living in these houses,” said the official who asked not to be named. The government says each house is costing about K300,000 and will be provided free to the families. Each measures 12 feet by 9 feet and has iron sheeting for roofs. U Tun Thar Sein, a member of the state parliament, said residents appreciated the housing and that the government had a responsibility to help support their livelihoods. “The government needs to help and support for their future, especially for their work. Most of them are farmers and bamboo cutters, and they cannot return home. They need a new job. The government should fulfil their needs,” he said. U Zaw Win who is helping the IDPs said the government should guarantee their future safety and security of IDPs in the future, and act immediately to get the IDPs back home. “None of the IDPs want to return home in the current situation because the military already announced its intention to eliminate the AA. And they don’t want to stay forever in these new houses. So the government needs to bring peace first,” he said. The monastery camps were set up during fighting between the military and the Arakan Army from December 28 to January 4 in remote areas close to the boundaries of Kyauktaw and Mrauk-U townships. 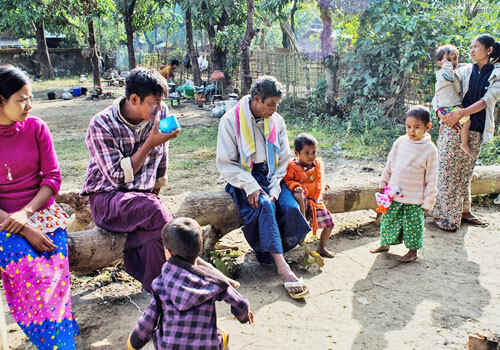 More than 300 people, all of them ethnic Rakhine Buddhists, fled their homes. The Arakan Army, which says it is fighting for self-determination for the majority Buddhist Rakhine people, is a recent arrival on Myanmar’s complex ethnic stage. It was founded in 2009 and is closely allied with the Kachin Independence Army (KIA), having its headquarters in KIA-controlled areas of Kachin State. According to the Myanmar Peace Monitor, it numbers about 1500 fighters. Some are fighting alongside ethnic Chinese insurgents on the other side of Myanmar in the Kokang border region of northeast Shan State.